Preheat the oven to 350. Place cooling rack over a baking sheet. Place bacon on cooling rack and into the oven for 10-15 minutes, until the bacon becomes crisp. Remove from the oven and allow the bacon to cool. Finely chop bacon to the consistency of bacon bits. Place the potatoes in a large pot, cover with water. Cover pot and bring water to a boil. Uncover and cook for about 20 minutes, just until the potatoes start to become fork tender. Drain and place them back into the hot pot to rest for about 15 minutes. Remove the potatoes from the pot and place them on a baking sheet. Drizzle olive oil over the potatoes, making sure they are evenly coated. Space the potatoes evenly on the sheet pan. Using the palm of your hand, lightly smash each potato. Sprinkle with salt and pepper, then drizzle an additional coating of olive oil over the exposed flesh of the potatoes. Place them in the oven and roast for 30 to 45 minutes, until the bottoms become a little crispy. Remove from the oven and allow to rest. 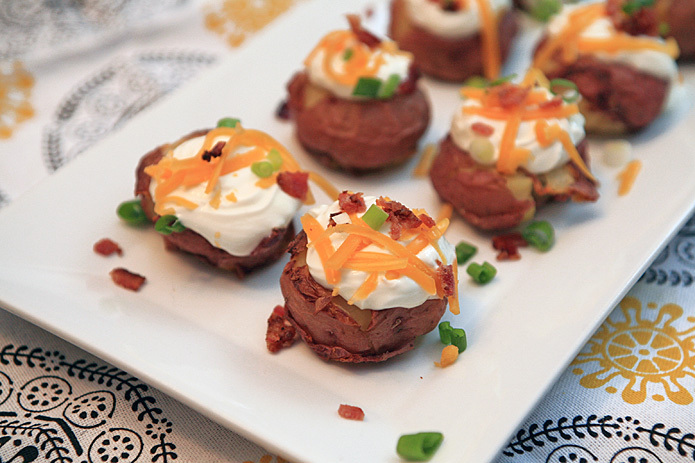 Transfer to your serving dish and top each with sour cream, cheese, scallions and crumbled bacon.